Despite global medical advances, access to healthcare across Southasia remains extremely uneven within the region. Basic healthcare, not just expensive surgery or prolonged treatment, remains out of reach of the majority. Healthcare is increasingly seen as a commodity rather than a public service in Southasia, even as advancements in medicine has increased life expectancy and found cures for many diseases. The extent of out-of-pocket medical expenditure indicates one of the major gaps in inclusive healthcare across the region. Commercialisation has permeated all aspects of healthcare, starting with medical education, to the dispensation of medicines and treatment, to the approach towards the human body as a site to be harvested for profit. 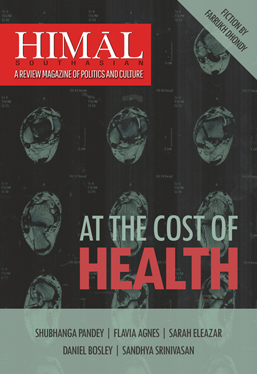 Our new quarterly edition, At the Cost of Health, examines the status of health in Southasia today, and asks what price can or should be put on it. The Indian Supreme Court now recognises ‘passive euthanasia’, but the issue of consent remains complicated. Flavia Agnes explores this complex subject, and asks under what parameters should the ‘right to die’ be framed? Radical anti-government groups sabotage polio vaccination campaigns in Pakistan, as a way to demonstrate their opposition to foreign intervention. Sarah Eleazar explores the phenomenon, and the need for such campaigns to take local conditions into account. Shubhanga Pandey unravels the nexus between political and private interest in medical education in Nepal, and how one stubborn doctor has opposed a vicious trend. The Maldives spends 11 percent of its budget on healthcare, but access to it is grievously uneven, writes Daniel Bosley. The country struggles to provide services to a population distributed over 200-odd inhabited islands, while overseas treatment is subject to a complex system of political patronage. Sandhya Srinivasan documents the complications of running clinical drug trials in India, and the rise of philanthrocapitalism in the region. Jessica Mayberry and Madhura Chakraborty report on the Video Volunteers project in Bihar, Jharkhand and Chhattisgarh, where men and women of the community document the problems faced by pregnant women and those in labour in accessing medical care. Statistics around Caesarean births provides a counter-intuitive overview of the state of medical care in different parts of India. Ayesha Minhaz describes a rate of Caesareans several times the norm in many states, due to a combination of lifestyle choices and promotion of procedure that brings private clinics more profits. Madhusree Mukerjee reviews The Last Wave, a compelling new novel about the Andaman islands by journalist, environmentalist, activist, photographer, and academic Pankaj Sekhsaria. Debleena Tripathi reviews Badal Sircar: Towards a Theatre of Conscience, a comprehensive, ‘authentic’ and contextual study of the playwright’s work by Anjum Katyal. Silence and shame, the brave recounting of Niranjan Kunwar’s struggle to get an incident of sexual abuse as a child acknowledged in a Nepal that does not want to talk. Print quarterlies will be shipped to bookstores and subscribers. Subscribe to Himal here. Do check this page (and our Facebook and Twitter profiles) to get the latest updates!